The Office of the National Coordinator for Health Information Technology is at the forefront of the administration’s health IT efforts and is a resource to the entire health system to support the adoption of health information technology and the promotion of nationwide health information exchange to improve health care. The FY 2013 Budget request for the Office of the National Coordinator for Health Information Technology (ONC) is $66 million, $5 million above FY 2012. The Budget provides resources to continue supporting, and further advance, the progress that ONC has achieved in creating a nationwide health information technology (health IT) infrastructure in response to the mandates set forth in the Health Information Technology for Economic and Clinical Health (HITECH) Act. In addition, ONC will continue efforts to accelerate the adoption of health IT and help physicians achieve meaningful use of electronic health records (EHRs). The Budget also includes resources for ONC to serve as the Federal health IT leader. ONC and the Centers for Medicare & Medicaid Services (CMS) are working closely together to register eligible professionals and hospitals to qualify for incentive payments from Medicare and Medicaid which are designed to encourage providers to adopt and meaningfully use EHRs. 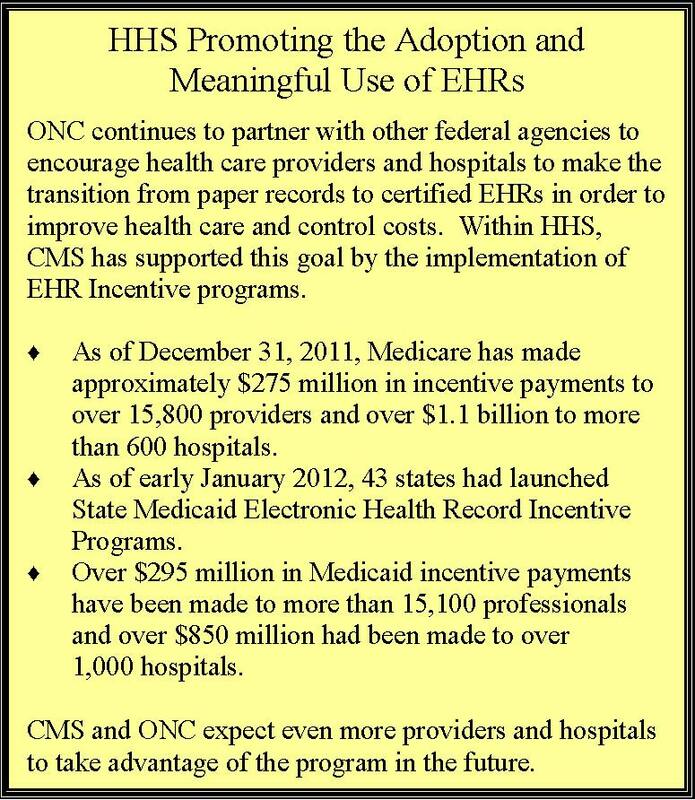 With incentive payments beginning in January 2011, ONC and CMS estimate 80,000 providers will have achieved meaningful use and received payments by the end of FY 2012. The ONC Health IT Regional Extension Centers (RECs) has made great strides towards the program’s goal to assist 100,000 providers adopt and demonstrate meaningful use of EHRs by FY 2014. To date, over 130,000 providers have registered to work with an REC.In asignificantmilestone,roughlyone-third of all primary care providers and more than two-thirds of all rural providers in the country are now working with ONC grantees.The providers working with RECs are a diverse group. Among them, half are from small private practices or small practice consortia, and over 20 percent are affiliated with critical access hospitals, rural health clinics, and other practices in medically underserved areas. In addition, 11percent of providers are in public hospitals and 18 percent are in community health centers.As of January 2012, nearly 60,000 REC-assisted providers had implemented EHRs with e-prescribing and quality reporting capabilities and over 5,000 of theseprovidershave achieved meaningful use.The RECs will continue toassist these providers with adopting and meaningfully using EHRs in their practices. Reducing barriers to the adoption and meaningful use of EHRs is essential to improving the quality and efficiency of our health care system. The FY 2013 Budget includes $7.8 million, an increase of $2 million, to allow ONC to work with health care organizations and community organizations to share best practices to encourage adoption and meaningful use of health IT. In addition, this funding will support Regional Extension Centers to leverage their relationship with providers to support other HHS priority programs, such as the National Quality Strategy. Development and maintenance of certification criteria and certification process;Coordination of federal participation in health information exchange. ONC also supports the Virtual Lifetime Electronic Record (VLER) project, a Presidential priority which is creating a unified electronic record for military personnel and veterans. Combined, these standards and interoperability activities enable ONC’s efforts to promote adoption and meaningful use of EHRs; facilitate electronic health information exchange to improve health care quality and delivery; and, enable consumers to play a more central role in directing their care through the use of technology. Privacy and security are critical to provider and consumer trust in electronic health information and participation in health information exchange. The Budget includes $5 million to assure that policies and practices are in place to keep health information private and secure in a rapidly changing environment. Key efforts include the evaluation and policy development of privacy and security protections for electronic health information in the evolving nationwide network. ONC will continue to coordinate the development and implementation of these policies with other federal partners as well as with the states, the territories, and foreign countries. To facilitate the private and secure implementation of EHR technology and Health Information Exchanges, ONC, in conjunction with other federal partners, will continue to identify good privacy and security practices and to develop and disseminate appropriate educational materials to health care providers and other stakeholders. ONC will also continue to explore security issues arising from patient-centered health care, such as secure electronic communications with patients. ONC continues to partner with other federal agencies to encourage health care providers and hospitals to make thetransition frompaper records to certified EHRs in order to improve health care and control costs. 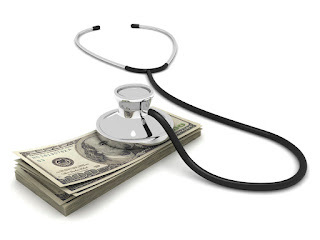 Within HHS,CMS has supported this goal by the implementation of EHR Incentive programs. As of December31,2011, Medicare has made approximately $275 million in incentive payments toover 15,800 providers and over $1.1billion to more than 600 hospitals. As of early January2012,43states had launched State Medicaid Electronic Health Record Incentive Programs. Over $295 million in Medicaid incentive payments have been made to more than 15,100 professionals and over $850 million had been made to over 1,000 hospitals.CMS and ONC expect even more providers and hospitals to take advantage of the program in the future. Health Care is a moral issue, the number of uninsured increased by 12 million people, which is an increase of 31 percent. Nice blogging, thank you for your blog.